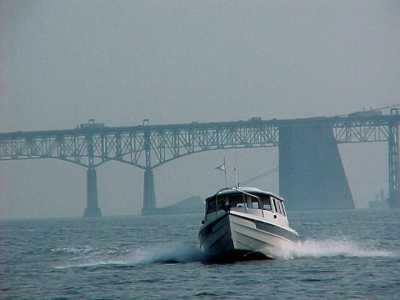 -----Everyone knows the Chesapeake Bay region is full of history --Colonial tales, Revolutionary War stories, Civil War battles -- lots of history. But that isn't the half of the tale. Here's the rest. 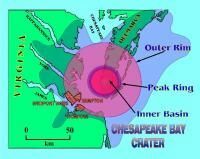 -----The most dramatic event that ever occurred on the Atlantic coast of North America took place about 35 million years ago where Chesapeake Bay is located today. -----Back in those good old days, about half as far back as the extinction of the dinosaurs, global temperatures were much higher. There was little ice in the polar regions. Water, long locked in glacial ice, had melted and flooded the oceans. Sea level, therefore, was much higher. If Richmond had existed then, residents could have gone out their back doors and been at the beach. -----Climate then was so warm and humid that the slopes of the Appalachians were covered with a thick tropical rain forest, similar to the Amazonian forests today. Animals flourished in the 'jungle.' 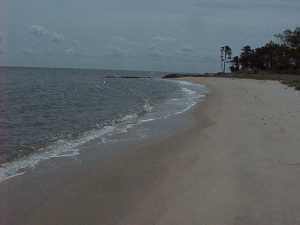 The sea, offshore from the Richmond area, was shallow, warm and teeming with life. -----Then, one quiet day when the critters were going about their usual business, there was a horrendous blast and a blinding flash. A huge extraterrestrial object, perhaps bigger than the District of Columbia, and traveling much faster than a speeding bullet, smashed into (what is today) Cape Charles, Virginia. The shock wave of a titanic explosion leveled forests and annihilated life over thousands of square miles. A huge crater, extending from present Norfolk to the mouth of the Rappahannock, and deeper than the Grand Canyon, was blasted into the sea shelf. 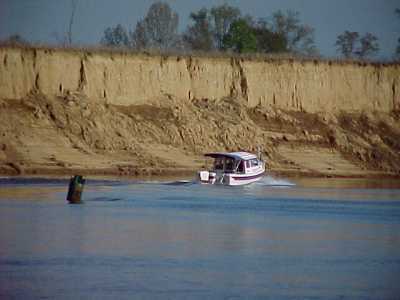 -----Since that long-ago day of disaster, sediments have washed down the rivers and buried the crater beneath several thousand feet of sands and mud. Recent drilling and seismic profiling have discovered the buried evidence of impact. -----Let's fast forward the scene of Chesapeake Bay. Eighteen thousand years ago, Earth returned to the deep freeze. Ice covered the polar regions. Huge ice sheets extended as far south as Long Island. There is only so much water on our planet. Water on the Earth is like money in your bank account. Water 'spent' in making ice means water 'withdrawn' from somewhere else to make the balance even. The withdrawal was from the world's oceans. Sea level fell to about 600 feet below today's level. Great Woolly Mammoths and huge Ice Bears wandered through the forests fifty miles east of the present shoreline. The ancestral river to the Susquehanna, swollen by glacial melt water, poured southerly past Baltimore, over the site of the crater, and then easterly past Norfolk and down the gentle slope of the continental margin to the sea. The river, and its tributaries, scoured out the soft sedimentary remnants of the Appalachian Mountains, forming broad valleys. -----Earth has a long memory. The rubble that filled the crater, and lay scattered over the surrounding region, was slowly compacted by the weight of the overlying sedimentary cover. The surface of the land, above the crater, slowly subsided, and may still be subsiding today. This lower land area helped direct and deflect the course of the rivers. The Rappahannock flowed directly southeast into the Susquehanna, but the York and James were deflected to the northeast near their mouths as they flowed into the subsiding area over the crater. -----About 10,000 years ago, the vast ice sheets rapidly began to melt. Sea level rose quickly, as much as three feet per century. The sea flooded into the valleys of all the rivers flowing into the Atlantic, but especially into the subsiding area over the impact crater. Chesapeake Bay extended as far north as Annapolis about 5,000 years ago. Tidal salt water invaded up the valley of the Susquehanna to the present head of the Bay about 3,000 years ago, and the Bay looked then much as it does today. The Bay has not been deeper or clearer since then. 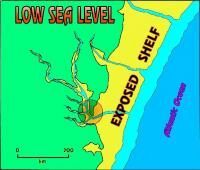 -----Now sediment is filling the Bay, accelerated in recent times by human activity. 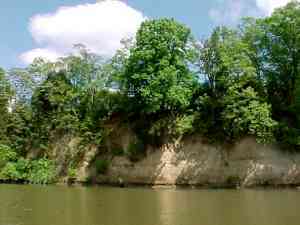 Bluffs are eroding to beaches that are eroding to shoals. 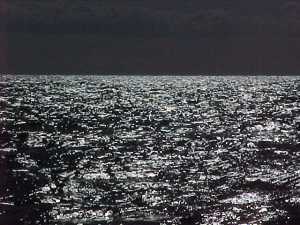 -----If the present rate of sedimentation continues, the Bay will be filled up in ten or fifteen thousand years. It will only be a geologic memory. Better not procrastinate with your cruising plans, folks!